Congratulations! Your business is doing great! You tapped savings, family and friends to get started. You worked hard, recovered from early mistakes and found your market. Now, it’s time to go big, really big; you’re ready to go after venture capital. Oh, wait. I’m sorry. You’re a woman. Welcome back. Let’s start in Europe. Sweden ranks at the top of the European Union’s Gender Equality Index, yet female-owned businesses, which account for one-third of Swedish businesses, receive only 7% of government venture capital. A study by researchers affiliated with Sweden’s Luleå University of Technology and Halmstad University and Finland’s Hanken School of Economics documented how gender bias entered into the assessment of venture capital applications. The study used interview data to first examine how 11 venture capitalists from two government organizations used notions of gender in assessing applications from 126 entrepreneurs (72 male, 54 female). -Women are cautious and risk-averse; men are ambitious and risk-taking. -Women are reluctant to grow their businesses; men are willing to do so. -Women do not have resources to engage in high growth; men do. -Women’s ventures underperform; men’s ventures perform well. To test these notions against fact, they statistically analyzed relevant performance indicators and accounting information for each of the 126 ventures. They found no significant difference between ventures led by men or women in any of the four identified areas: risk-taking, growth, growth resources or underperformance. In short, the perceived gender differences affecting funding decisions are myths. OK, that’s what happens in Sweden, not the U.S. Wrong. A 2017 article in Fortune magazine reported that, of the billions venture capitalists invested in 2016, only about 2% went to women. That doesn’t appear to have changed much in 2017 (see figure). 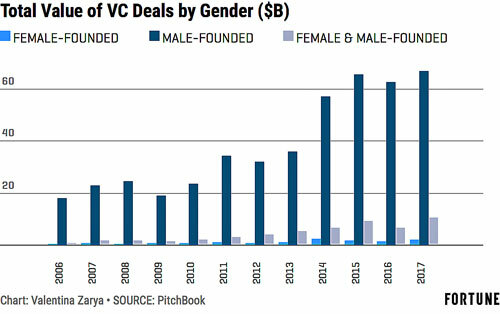 Yearly venture capital funding ($ billions) for U.S. startups founded by men, women and both men and women, 2006-2017 (from fortune.com/2018/01/31/female-founders-venture-capital-2017/). Would male and female venture capitalists make different funding decisions? Maybe. Research collaborators from the California Institute of Technology and University of California, San Diego, studied angel investors--individuals who invest their personal funds in a business; venture capitalists invest other people’s money. Their analysis of a proprietary dataset from AngelList, a U.S. website for startups, angel investors and job-seekers, found male investors expressed less interest in female-led startups than in similar male-led startups. In contrast, the same female-led startups were more successful than male-led startups with female investors. The results did not appear to be driven by differences in startup quality, sector focus or risk. So, adding female investors might help balance the gender funding gap, but there’s a long way to go. The Wall Street Journal highlighted a 2017 analysis of 71 top venture-capital firms that found less than 10% of their investment-team members were women. An interesting sidelight to professional investing in startups is crowdfunding, where many small amounts of money are raised from a large number of amateur investors. PwC in collaboration with The Crowdfunding Center analyzed 2015 and 2016 data from nine of the largest crowdfunding global platforms. They found that, although men sought startup crowdfunding more than women, women were more successful at reaching their funding target across a wide range of sectors, geography and cultures. For example, considering total global campaign activity, men initiated about 2.5 times the number of startup campaigns as women, yet 22% of women-led campaigns were successfully funded compared to 17% of men-led campaigns. Data for the U.S. showed men initiated 2.3 times the number campaigns as women, yet 4% more women-led campaigns were successfully funded. Total global crowdfunding activity in 2015 and 2016 for male- and female-led startups (from www.pwc.com/gx/en/about/diversity/womenunbound.html). After finding similar results in their analysis of 416 projects from the crowdfunding platform Kickstarter, researchers from Louisiana State, Indiana and Suffolk universities conducted an experiment with 73 amateur investors to get a sense of why women were more successful than men. Female entrepreneurs were seen as more trustworthy, trustworthiness fostered funders’ backing and the funders’ implicit gender bias strengthened those effects. Getting back to professional investors, I’ll close with one bright note: Founders for Change. This is a loose, growing coalition of over 900 founders and chief executives who are improving diversity and inclusion within their companies and pressuring the venture capital industry to diversify.